Having Left the Altar: Welcome, Spring! Well, Spring has definitely arrived. We had a week of rain and now a week of sunshine with high temperatures in the high 60s and even into the low 70s. It has been absolutely gorgeous. 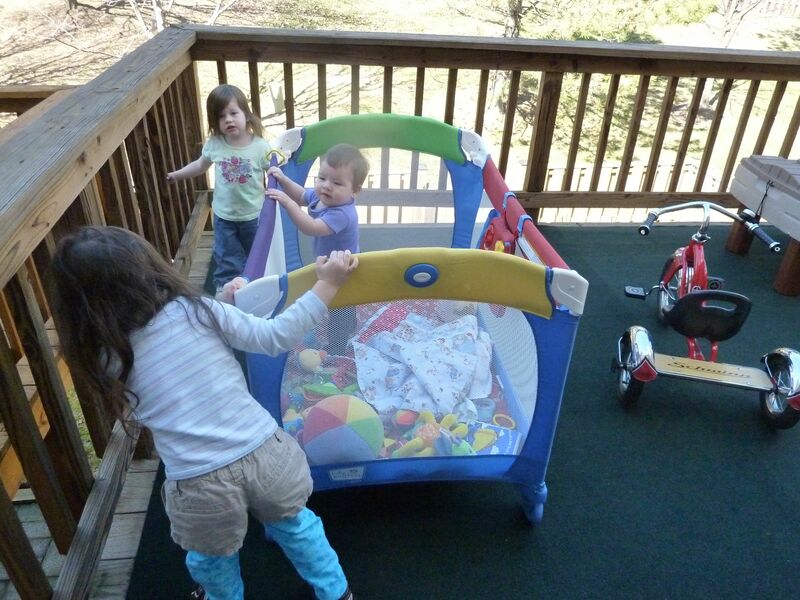 I brought the bassinet outside so Elizabeth could enjoy some fresh air too. Cecilia played Peek-a-Boo with her around the bassinet. 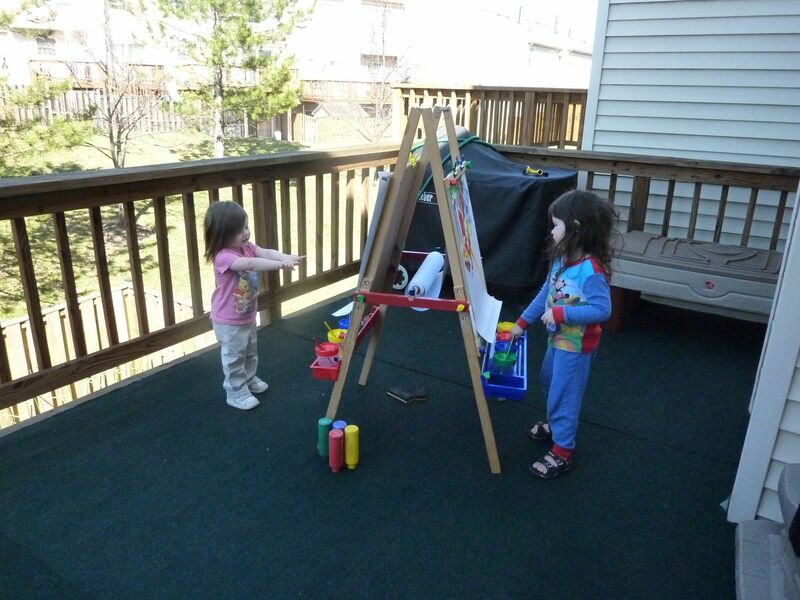 The girls love to draw and write with chalk on the deck. 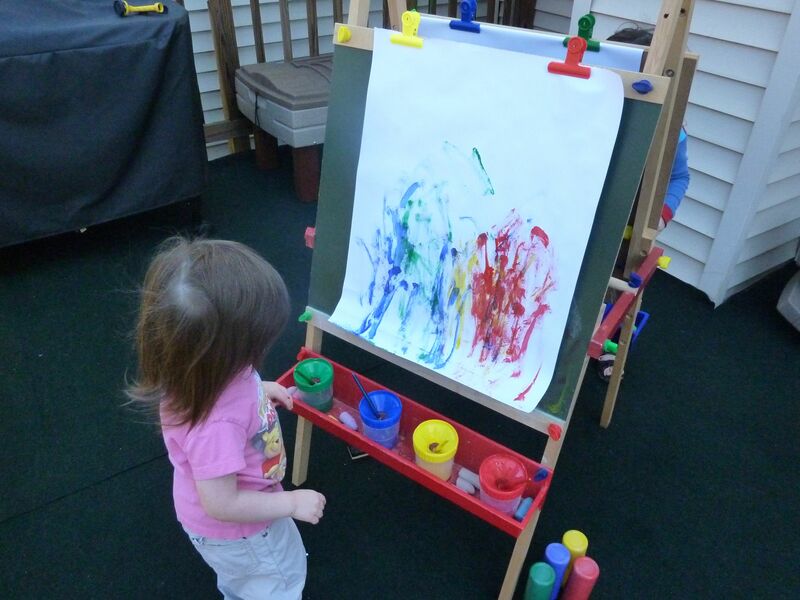 Cecilia draws pictures and practices writing letters, numbers and shapes. 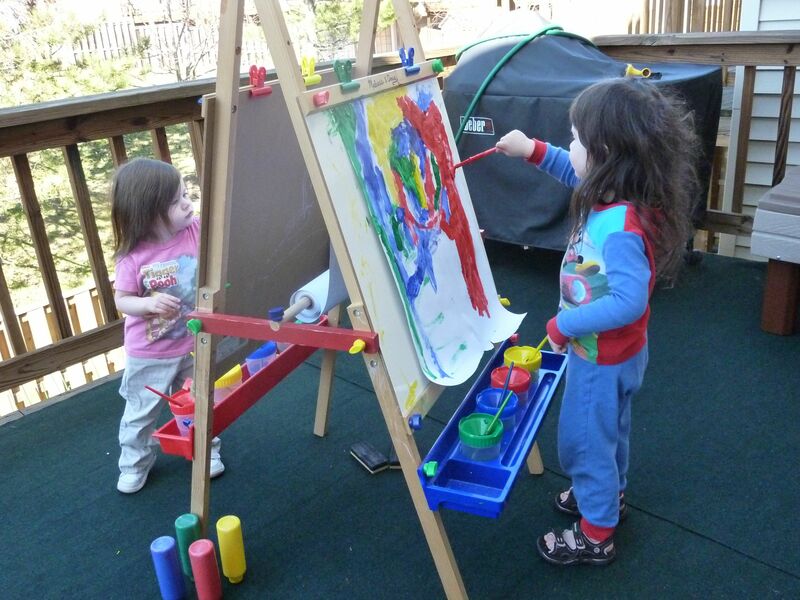 Felicity loves to color everything from the railings to the play box to the screen and windows. 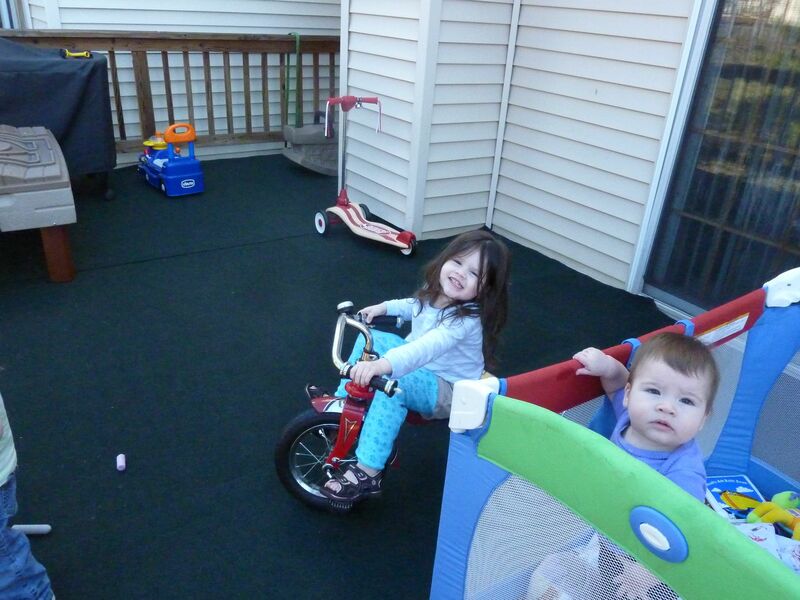 And of course we got out the tricycle, on which Cecilia is a pro, the scooter, and the train car. 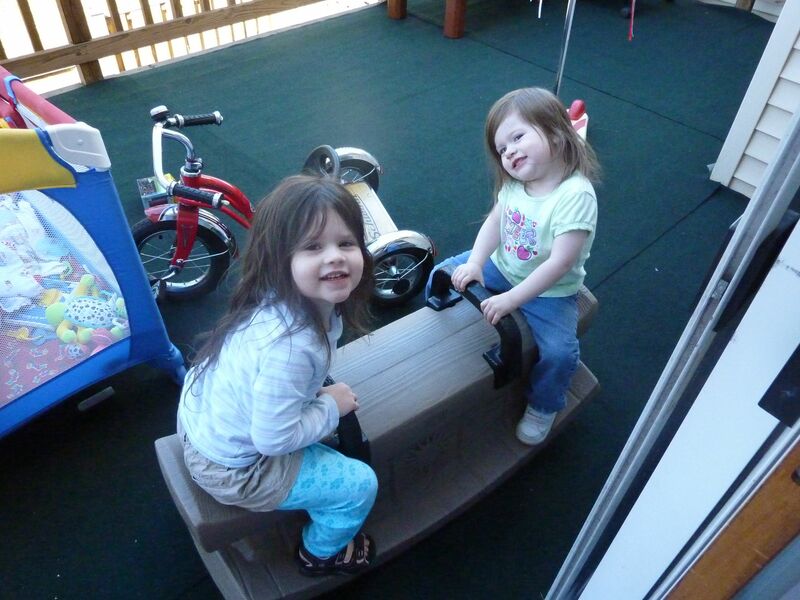 Cecilia and Felicity have mastered the seesaw as a team or individually. 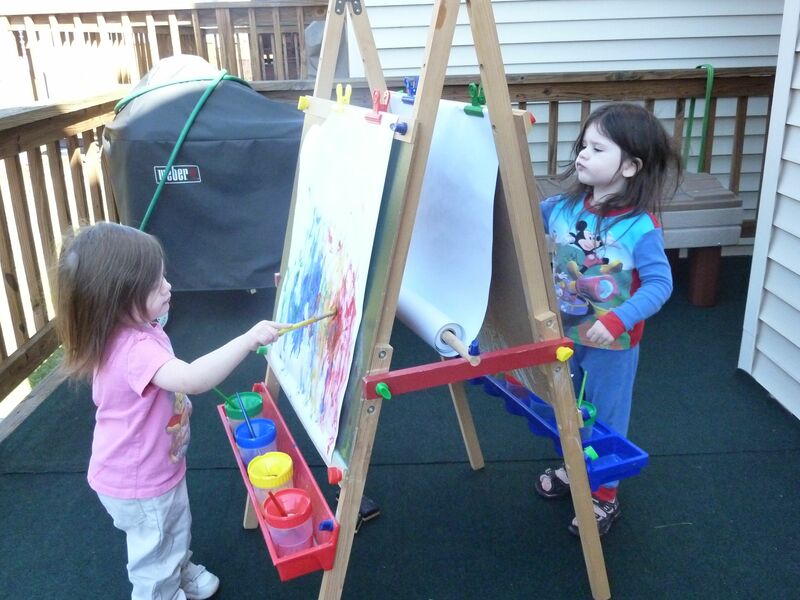 Per Cecilia's request, we pulled out the easel and set it up for both girls to paint. Felicity absolutely loved it. 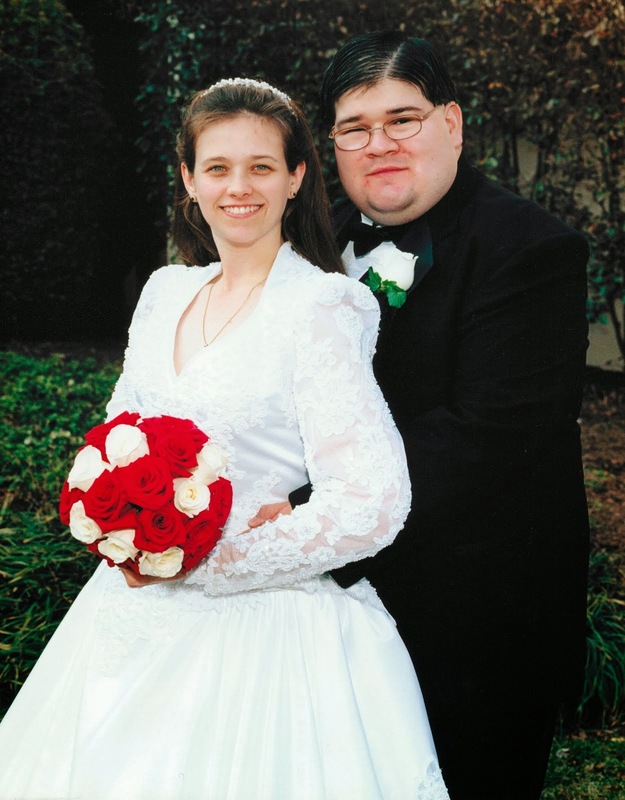 She didn't want to stop. I had to stop refilling her paints before she quit. 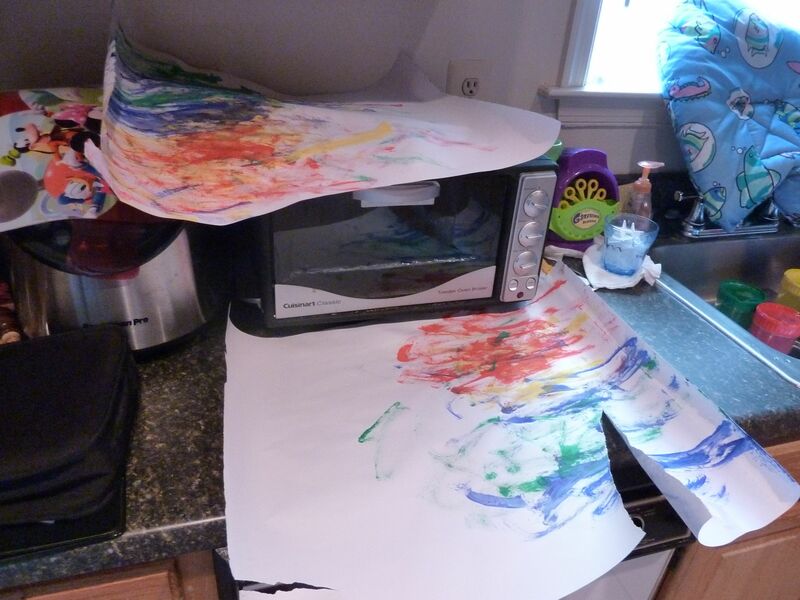 She said this painting was a castle. 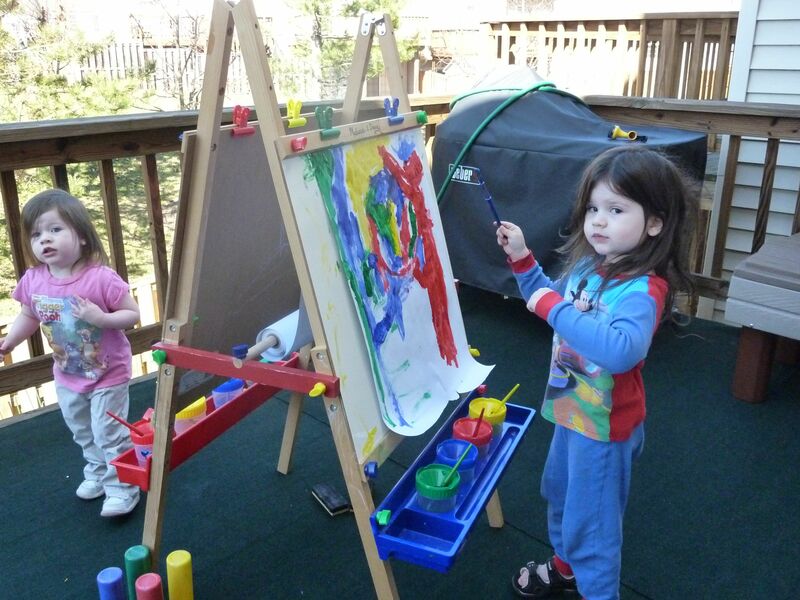 I love how serious Cecilia's face is while she is painting. And she did take it quite seriously. 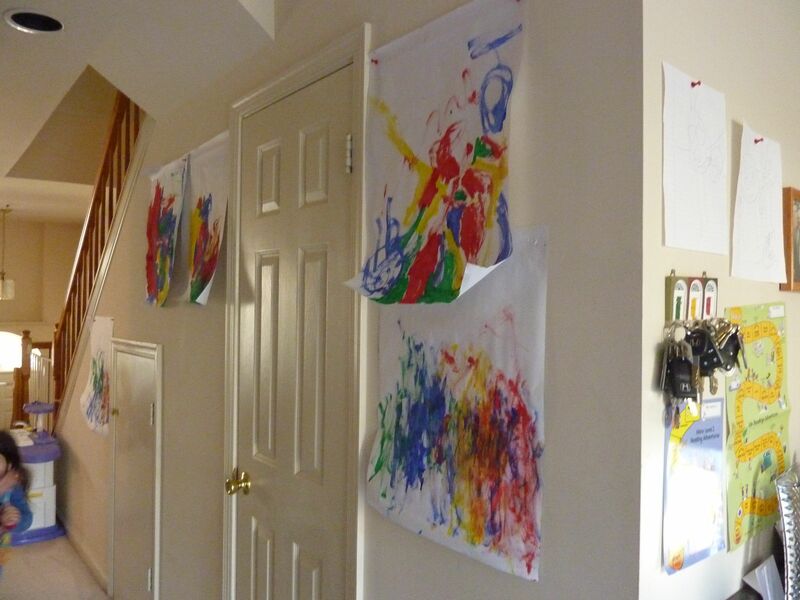 She didn't want me to look at her paintings until she was completely done with them and needing a clean piece of paper. I think she is scolding me for peeking but you can see how she didn't just throw the colors up there on top of each other. 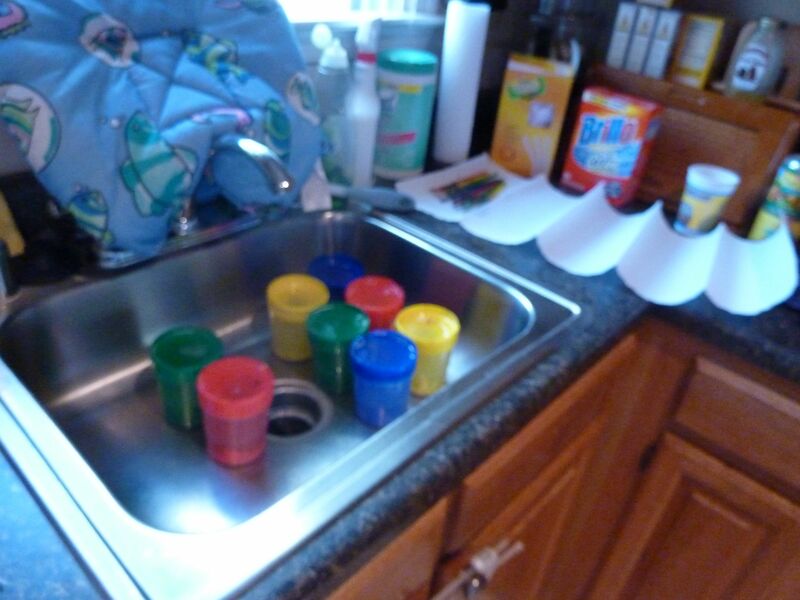 She was deliberate in where she put each color. 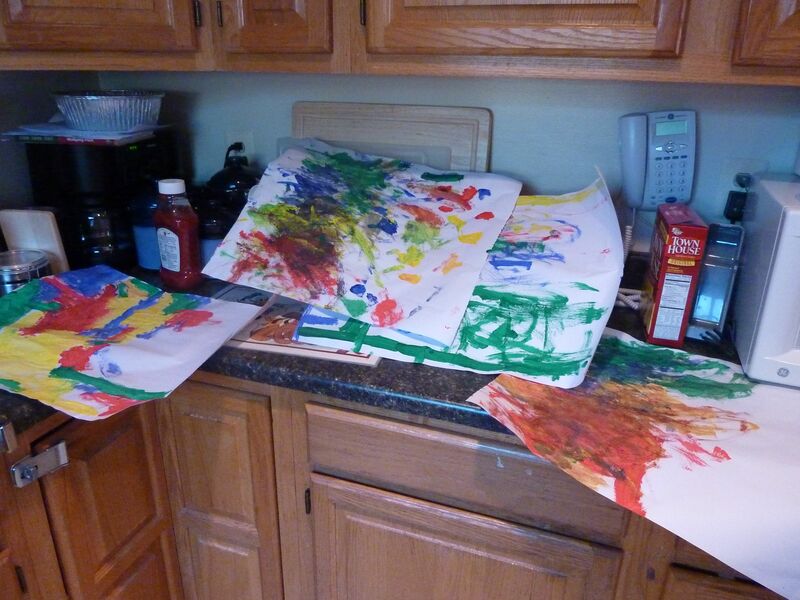 A far cry from what she was painting a year ago. 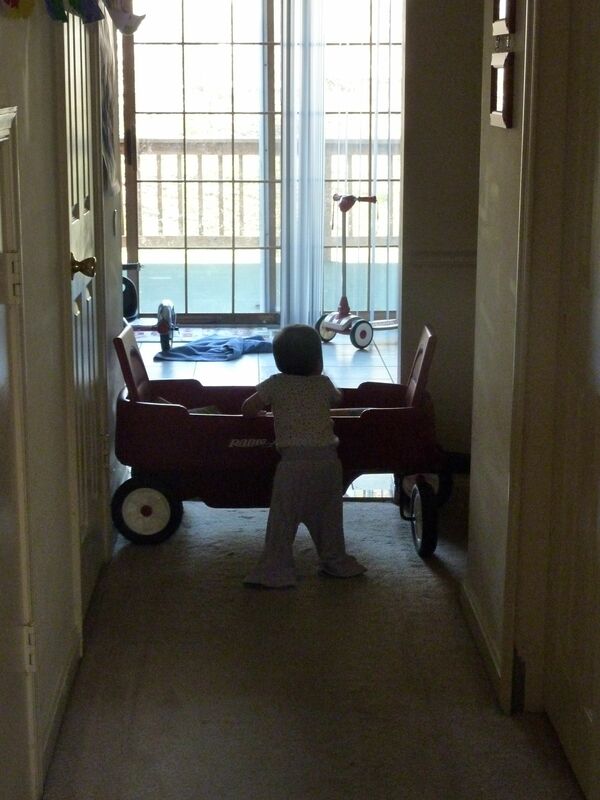 Once Elizabeth tired of the limitations of being in the bassinet, I had to bring her inside and I used the red wagon to block her from getting to the kitchen and the sliding door to the deck where her sisters were painting. She stood by it though trying to see them paint. 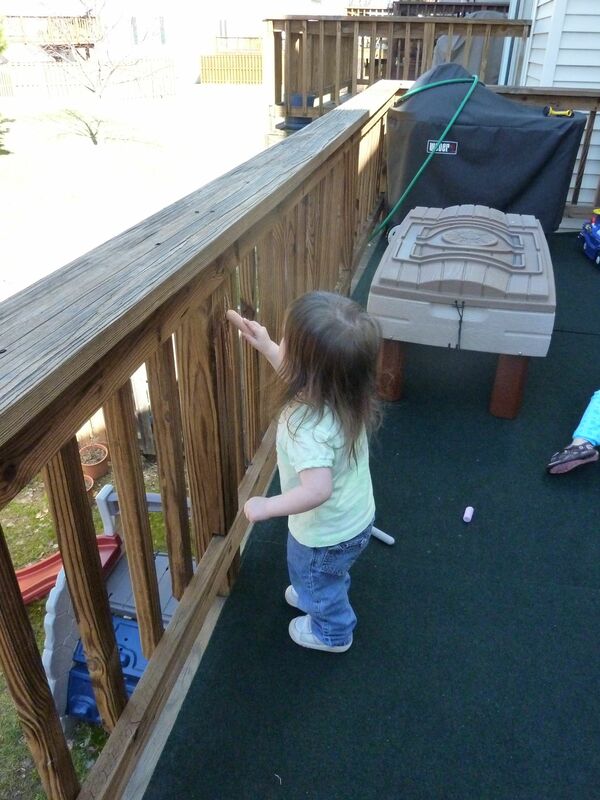 She can stand on her own now without holding on to anything. 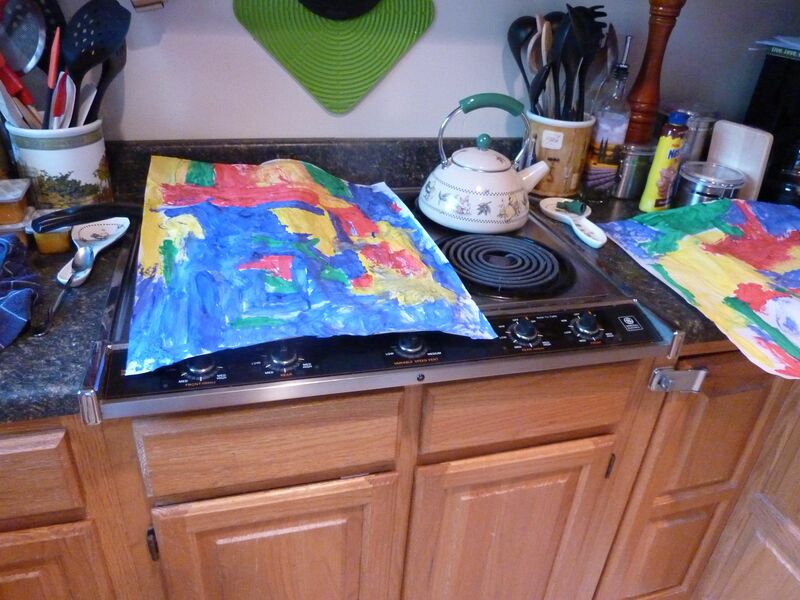 and a covered counter all with drying artwork. Not bad for an early spring day! And out front our lilies and tulips and hyacinths are popping up! I'll get pictures up eventually.